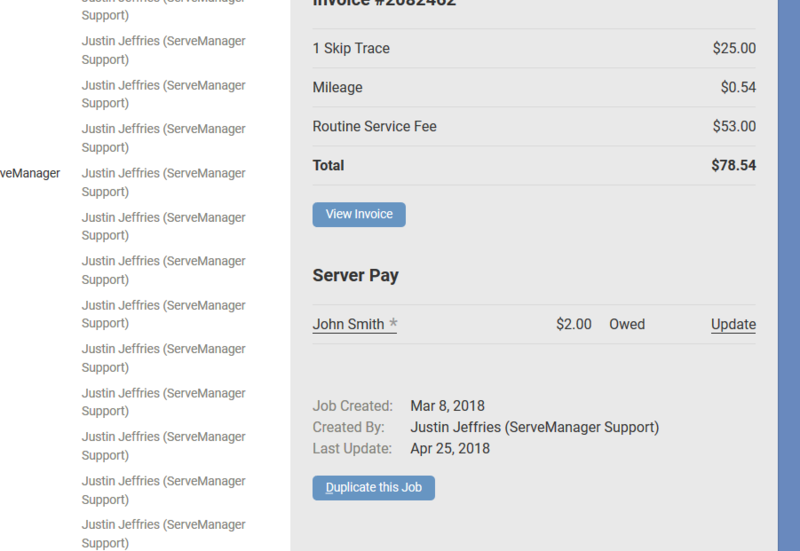 ServeManager is excited to announce Server Pay, a major feature release. With the addition of this suite of features, paying your servers has never been easier! Server Pay allows you to track and monitor payments to servers and contractors. You are now able to set default rates for both servers and contractors, as well as setting rates individually, in jobs. 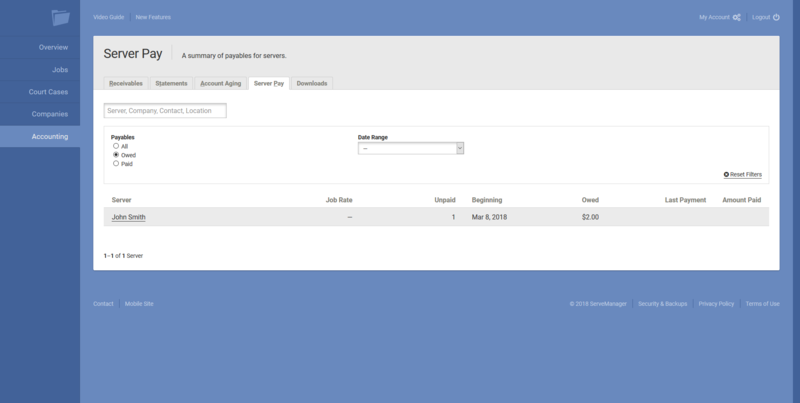 Server Pay will also allow you to switch servers, and choose the rate of pay for each server listed on a job. Invoice creation and statement generation will remain the same. To turn on server pay, select my account, then the settings tab. Scroll down to the Server Pay section and select the checkbox. There are 3 places to set the Server Pay depending on your needs. First is in the settings, below where Server Pay is turned on. This setting is the account wide default. Next is in the employee or contractor. For employees; select My Account and then the Employees tab. Then select the employee , and press edit. This will set the default pay for the server. For a contractor; go to the companies screen, select the company and then press edit. Scroll down to the Server Pay section. Entering payment information for a contractor or server will supersede payment information entered in the settings. The last place to set Server Pay is in the job itself. You can do so when creating the job or editing it, in the process server section. Setting pay here, supersedes all other places where Server Pay can be set. You are still able to change servers in the same ways, but now, with Server Pay, you are able to choose if a previous server is paid. Payments to servers in a specific job can be updated, at any time. To do so, simply open the job and navigate to the Server Pay section. You can track your balances as well as payments to servers as well. First navigate to the accounting screen, then select the server pay tab. Here is where you can view balances, payments and make payments as well. 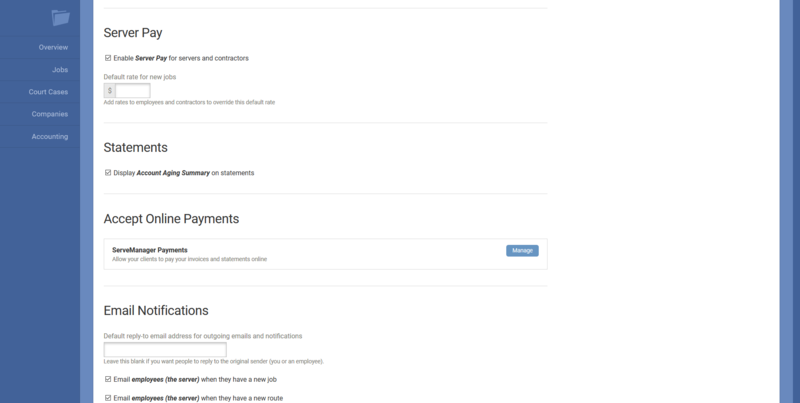 You can even apply many payments (for multiple jobs) to a server at one time. The Server Pay suite of features is available to all subscribing ServeManager customers and you can learn more by joining us for our ProSeries Webinar on May 10th at 3pm mountain time.